Union Home Minister Rajnath Singh on Friday celebrated Dussehra and performed 'shastra puja' in this forward post of the Border Security Force along the highly sensitive Indo-Pak border, officials said. 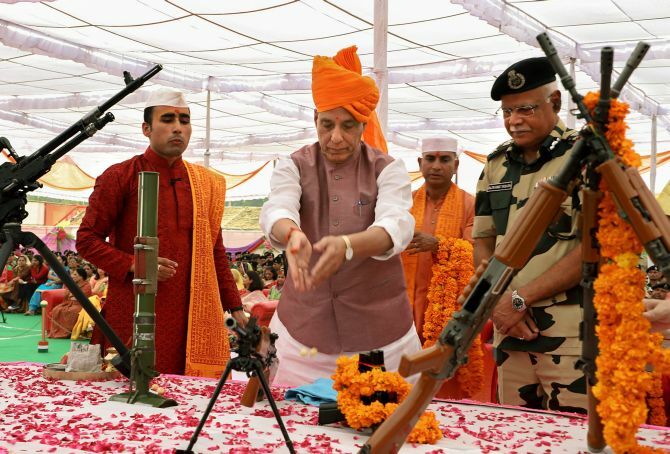 This was for the first time that a senior minister of the central government conducted the 'shastra puja' or worship of weapons on the occasion of Vijaya Dashami along India's border with Pakistan. The home minister, who arrived at the frontier headquarters of the BSF in Bikaner on Thursday evening, celebrated Dussehra festival with the jawans, an official said. 'Shastra puja' is part of the Dussehra festival which is celebrated for the victory of Lord Ram over Ravana. During the two-day visit, the home minister interacted with the family members of the BSF personnel, attended a feast with the jawans and addressed the security personnel, another official said. Singh also reviewed the situation on the border and assessed the progress in various infrastructure projects.